"'Banebringers. Source of the bloodbane who stalk the land. Cause of a thousand wrongs. Despised. Cast out. Hunted. Vaughn never asked for the powers of a long-forgotten moon goddess. But rarely do the gods give humans a choice when using them in their machinations. Now Vaughn is a Banebringer, loathed by all who discover his true identity—even his father, a man obsessed with his own power and bent on destroying Vaughn's miserable life. Vaughn is desperate to end his father before the madman ends him. But to do so he'll need the skills of Ivana, a vindictive assassin with her own scores to settle. The only question is whether Vaughn can keep himself from becoming another of her targets long enough to see his father eliminated." Well here's another stunning self-published fantasy to add to the 'must-read' list! Just when I think there's no way I could read yet another great fantasy debut, I'm proven wrong. Banebringer is an exciting, well-developed, and deeply intriguing fantasy that I am so glad to have had the chance to read. There are a lot of things to praise in this book, but I'll start with the world-building and magic system. The magic system itself is really incredible. It's of the elemental variety, which is a type of magic that I always enjoying exploring, and it was also the type of magic I actively enjoying learning about. It has some unique elements that really stood out to me and that really elevated the quality and strength of this book. It's easy for magic systems to be overly complex at the beginning of a fantasy novel and turn readers off, so I was particularly impressed with the one Park has created for this world. There are two main characters that we follow, Vaughn and Ivana, and both were fantastic. The setup is sort of the classic hate-to-friends relationship due to some seriously clashing personalities, and while I know some people dislike this scenario, I can't help but love it. I also want to note that the antagonist in this one was so well done and I really liked how Park crafted their motives and story together with the two main protagonists. Ivana is a talented assassin with a tough exterior and an assertive personality that won't let anyone walk over her, while Vaughn comes across as more shallow and power-obsessed. They were both well-developed and brought so much life to the story, adding some drama, some humor, and some authenticity. Ivana may be hard-shelled, but she still feels deeply; Vaughn may seem shallow, but there is so much more to him than meets the eye In a book of this size, it's extra important to have multi-dimensional characters that you can become attached to, and Park did this wonderfully. Even the secondary characters seemed carefully developed and added to the story in productive ways. For being nearly 600 pages, this book is surprisingly fast-paced and leaves very little in the way of lagging, which is an impressive feat for such an epic fantasy. I found myself glued to the pages and constantly looking forward to what was next, which, again, can be quite a challenge with a hefty tome. 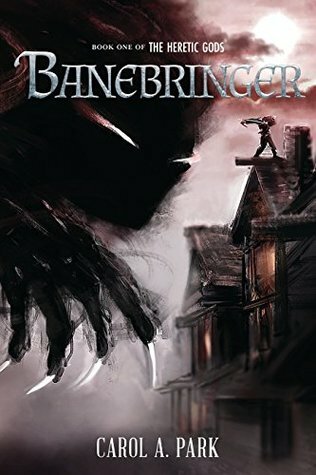 Overall, I have very little to critique of Banebringer and can easily recommend this to any fantasy fans out there--4.5 stars from me!